9-7 ,why do we love it so much? I think the first I was aware how players love 9-7 was probably about 10-12 years ago. I was watching a tournament on Pokerstars with Apestyles. He 4-bet all in with 97s and he was up against Aces. When they flipped the cards, I thought "WTF, He went all in with 97? What is he crazy ?" Sure enough, the flop comes, and he rivers a straight, or was it a flush ? Either way, he won that hand and since then I started playing 9-7 as often as I could. I still do, and so does most players. Is it really that strong of a hand? Why don't we fall in love 10-8 or 8-6 or 7-5? Something about 9-7 that players go crazy over. Tell me what you all think. Do you play that suited connector more often then any others? Similar Threads for: 9-7 ,why do we love it so much? It's all situational in my opinion. I like raising these types of hands(97, 68, 810 all suited) in late position and even 3bet them in late position depending on the player who opened. I think the reason a lot of people like them, and why I like them, is they are very disguised on the flop. They are hard hands for your opponent to put it on you. I wouldn't 4bet all in with them lol unless it is a very specific player read! I can't imagine 3 betting with 9-7, maybe I am a litt bit too much of an ABC player. In position with a limped pot I would agree that it is a very nice hand that can win a big pot. I just don't see how putting a lot of $ in pre-flop can be a +EV move in the long run. They flop very well against low and middle pairs but straits and draws are pretty rare. Against AA you have 21.5% chance to win but 33% against 88 or smaller pairs. re: Poker & 9-7 ,why do we love it so much? I love the 53S it dominates the low. 97 has reverse implied odds with J9 straight. But 53 has no reverse implied odds as whoever plays 63 is a long run fool.53s backdoor flush draw and the pots are HUGE. To be honest, if I have any connectors especially when there suited I play them to flop if I can limp in, I just like sometimes catching small two pair str8 or flush, it really catches people off guard, the only problem I have is that if you catch a flush with small cards someones flush can beat you easily, other then that love em! no a bad card 97suited but you have to pick them wisely. Well 97s and similar hands are sneaky for one thing! If you're playing deepstacked these are good hands to get in cheap and rake in big pots. If you mainly play high cards and high pairs then aware opponents can make plays against you on connected medium and low card boards. It is better to have some of these hands in your ranges so you can hit hard on these boards... your opponent may still fold to you on high card boards when you miss too! I think its the way our perception is. Like for example i liked the hand K9 alot, come to realize i like canine dogs LOL! I liked A7 come to find out i loved the gun AK47. So sometimes these hands can trick us into believing we have some type of connection with them lol. Otherwise rags are rags..be careful. I have these cards, do not play. On the table J, 10, 8. I have a 9.7 big blind, the player in the small blind Q and 9. We go to all the chips I lose. It ia a matter of intuition...Everyone might has a favorite pair or pairs, which some of them remain the same and the rest change, so it is a maths matter also. I often play on the map 9-7 8-6 10-8 9-6, but only when there is not a big bet, and this card sometimes plays well even better than the big cards, but on this card it's very dangerous to play all-in! I play them on late position only ! I always refer to this chart when trying to decide whether or not to play these speculative hands. Of course, the higher face value of the cards the better (usually) unless you hit a very low board. But even then you're potentially in a difficult situation as you may be facing a higher straight/draw or more likely a higher flush/draw. Remember at low stakes tables people tend to play suited anything a lot more than they should. i'm folding 97o almost always unless in the BB to a min raise for example. 97s from late position as an open depending on stack size and type of players left to act can be profitable I believe. It's not a good hand bro, just on your mind, stop betting on it. I think the hand is bad losing hand. I never felt any special feelings for 9-7. 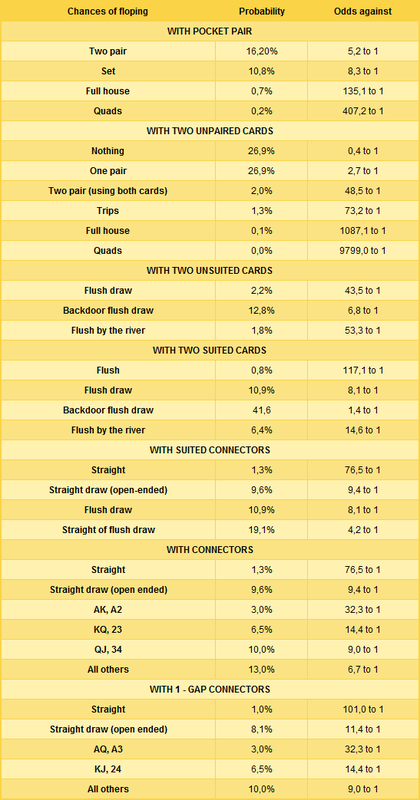 A weak hand that is played only on the passive table or when you on a blind. It's my opinion.